Due to the high durability, excellent bearing and wear characteristics, resistance to chemicals and corrosion as well as low relative cost, plastic components have become the choice of educated engineers in the design and manufacture of today’s high tech material handling equipment. Plastic bearings offer inherently low friction properties and are available with a variety of internal lubricants, making them an effective replacement for bronze and other metallic bearings. Designers are often able to eliminate the need for external lubrication completely while reducing potential damage to mating surfaces. Plastic guarding is an effective solution to provide personnel protection from moving parts while maintaining operational visibility. Polycarbonate machine guards offer the high impact strength required to provide safety while still maintaining the optical clarity required to effectively operate your equipment. Polycarbonate’s relatively good chemical resilience makes it resistant to breakdown and crazing that can occur with other amorphous plastics. LVP’s unique combination of CNC cutting, machining, fabrication and assembly operations make us the best choices for high quality machine guards and panels – any type, any style! Plastic chain guides provide excellent wear resistance, are non-abrasive to the chain, and have excellent sound dampening qualities. TIVAR® 1000 (UHMW) chain guides are FDA, 3A Dairy and USDA compliant. TIVAR’s® self lubricating properties will result in longer chain life for your units as well as quieter operation, and are available in a variety of filled and unfilled formulations. Plastic corner tracks provide a low friction surface that will allow you to maintain high speed product movement without risk of damage. Plastic corner tracks are a cost effective solution to reduce downtime while providing the added benefit of superior wear resistance and noise reduction along with corrosion/chemical resistance. These items are available in several FDA and USDA compliant grades of UHMW as well as Nylatron® for more demanding applications. Corner Tracks are available in standard 10 ft straight sections or custom sizes for Tab, Bevel and Combination designs for both carriers and returns. Corner Tracks can include straight extensions at each end to provide the smoothest transition possible between turns and straight sections. Corner Tracks can be manufactured to accommodate multiple lanes. Corner tracks are supplied in 90° sections unless otherwise specified. Plastic guide rails and wear strips provide a low friction surface to provide easy movement of products. TIVAR® guides and wear strips are easy to install and offer superior life for conveyor belts, chains and other dynamic applications. TIVAR® can reduce noise levels up to 50%. UHMW weighs only 1/8 as much as steel but can outlast it 3:1 in most conveyor applications. TIVAR® UltraRail assemblies fit existing clips and mounting brackets. TIVAR® J-Leg and snap-on wear strips are excellent for use with modular belts, steel grate bakery chains and flat top conveyor chains. J-Legs wear strips are available is several sizes and length. Snap-ons wear strips are available in straight lengths and coils. Wear-Max snap-on profiles are ideal for the most demanding applications where longer wear life and greater stability are required. Starwheels and guides are offered in several grades of UHMW, Nylon, Acetal® and Ertalyte® PET for the most demanding applications. Plastic starwheels are light weight, non-abrasive to products and can be color coded for easy change overs. Plastic starwheels and guides are considered non-abrasive to PET-G, glass, tin and aluminum containers which allows for high speed operation of your equipment without the risk of damage to the end product. Their reduced weight makes them easier to handle during installation and maintenance, resulting in more up time for your equipment while color coding to other components such as augers helps eliminate uncertainty that the proper parts will get put onto your equipment at each change over. Plastic gears and sprockets offer outstanding wear resistance and are non-abrasive to mating parts. 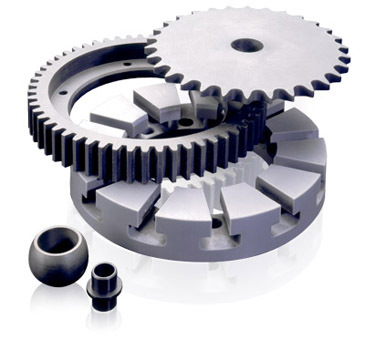 Plastic gears have been widely accepted as a way to reduce wear against contact parts and run quietly without any need for external lubrication. Materials such as Acetal® and Nylon are non-corrosive and offer the excellent mechanical properties required for helical, spur, worm and bevel gears. UHMW is commonly chosen for use in sprocket applications where lower coefficient of friction and impact strength are important. Although metal gears have higher mechanical properties, the ductility/resiliency of plastic allow for “flex” in the gear tooth when mating with a metal gear. Plastic gears are often used as a low cost “sacrificial” component that will prevent damage to more expensive parts of your equipment should a system failure occur. Plastic gears work best as an idler gear in combination with metal gears. However, plastic on plastic assemblies can and do work if designed from dissimilar materials. In order to successfully design your gear or sprocket and derive the maximum benefit that plastics have to offer several factors such as backlash, root radius and many other factors must be taken into consideration. Plastic pulleys are self-lubricating, light weight and provide significantly longer cable life. Not only are plastic pulleys light weight (7-8 times lighter than steel), they are corrosion resistant, reduce noise levels, and can extend the cable life of your units up to 4 times! Similar to plastic rollers, in some low load and velocity applications plastic pulleys can be run directly on the mating shaft. Bronze bushings, and in some cases roller bearings, are recommended in higher load applications to allow for free movement without risk of damage to the pulley. Plastic rollers are impact resistant, self-lubricating and non-corrosive. Plastic rollers contain the perfect balance of vibration dampening, hardness, abrasion resistance and low coefficient of friction that fills the niche when metals are too hard and elastomers are too soft. Due to the self-lubricating properties of plastic, it is possible to run the plastic directly on the supporting shaft. This is the least costly option and is typically used in applications where the limiting PV is low and usage is not continuous. More demanding applications may call for the installation of a bronze bushing or possibly roller bearings. In applications where the roller will be exposed to side load, a means of mechanical fastening such as snap rings will reduce the potential of axial movement. Plastic shaft collars are durable, dimensionally stable and light weight. Plastics offer an excellent low cost, lighter weight alternative to traditional bronze and stainless steel components. Many plastics such as Acetal® and Ertalyte® PET offer excellent mechanical strength, dimensional stability and are non-staining which make them great options for food processing applications. With all the possible choices of plastic materials and important design considerations the prospect of choosing the correct material for your application can be an intimidating task! Please contact LVP with your specific requirements and put our expertise to the test.